Add some sparkle to your interiors with my Find of the Week! 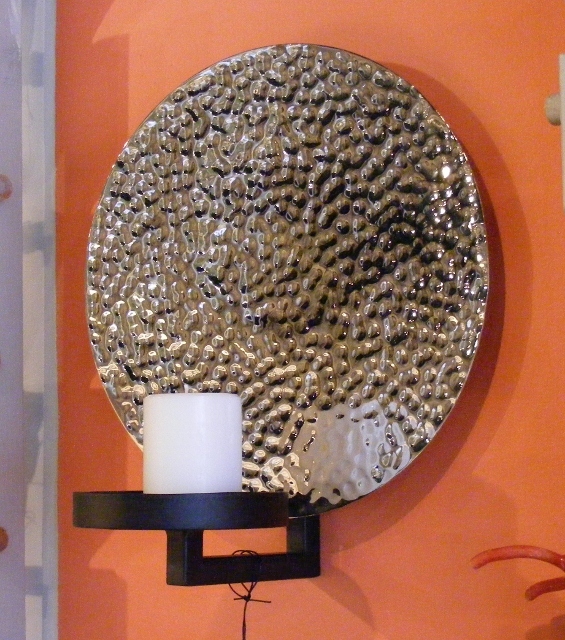 Expression’s Furniture on Glenwood Ave. in Raleigh had 2 of these sconces on sale and they are fabulous. I’d describe the disc as hammered chrome, about 14 inches across. The candle holder is a dark metal (but I didn’t touch it, so who knows?) It’s a smart look that could flank a piece of furniture, add light and reflection to a dark corner, make an urban statment in a powder room, spiff up a small dining area, etc. Here they both are, in all their glory. $59.00 each. $59! A LOT of bang for the buck. But there’s just two of them, so get on over there and scoop them up! Does this look familiar? It sits, all by itself, in a residential part of Six Forks Rd. The owner, Diane, is there Wednesday through Sunday, from 11:00-7:00. Pay attention to those hours so you don’t frustrate yourself. It’s a small shop, but between the areas outside and inside, there are lots of things to see and buy. This picture only shows you one corner. 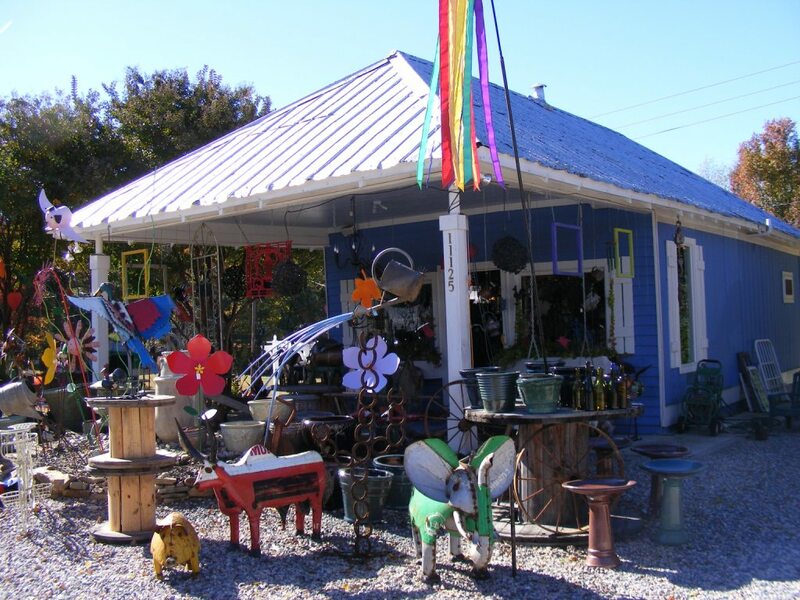 Fair trade items, local artists, NC products abound. 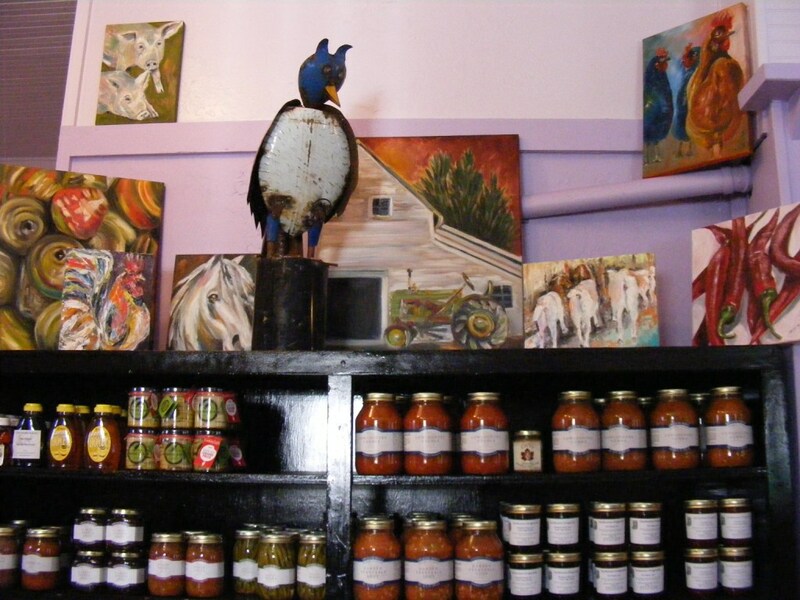 The lovely artwork above the shelf is by Susan Dahlin Bashford, a Raleigh artist. Ornaments, soap, handbags, scarfs, clothing, jewelry, food, metal art, antiquey pieces, garden sculptures, cards, oh, I’ve got to stop because I know I’m leaving out a ton. 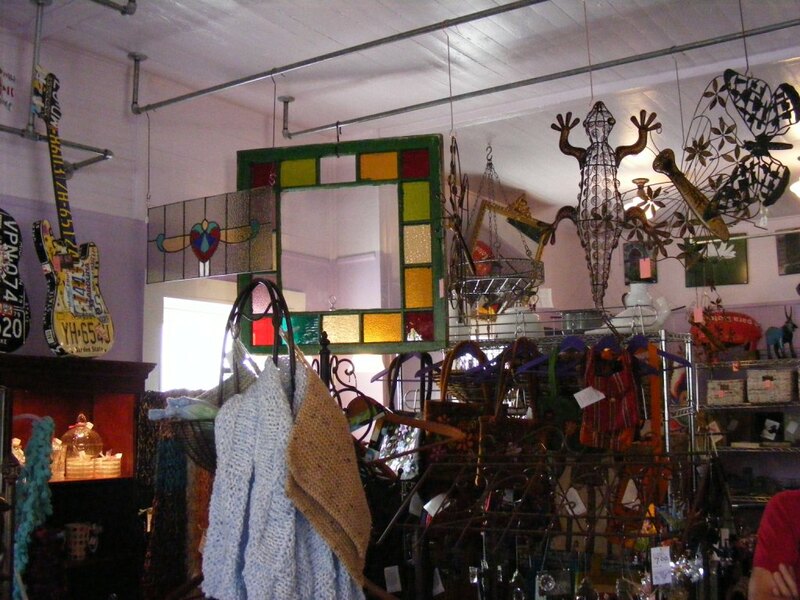 This is a great place for interesting pieces for the home as well as gifts for teachers, hostesses, friends, etc. 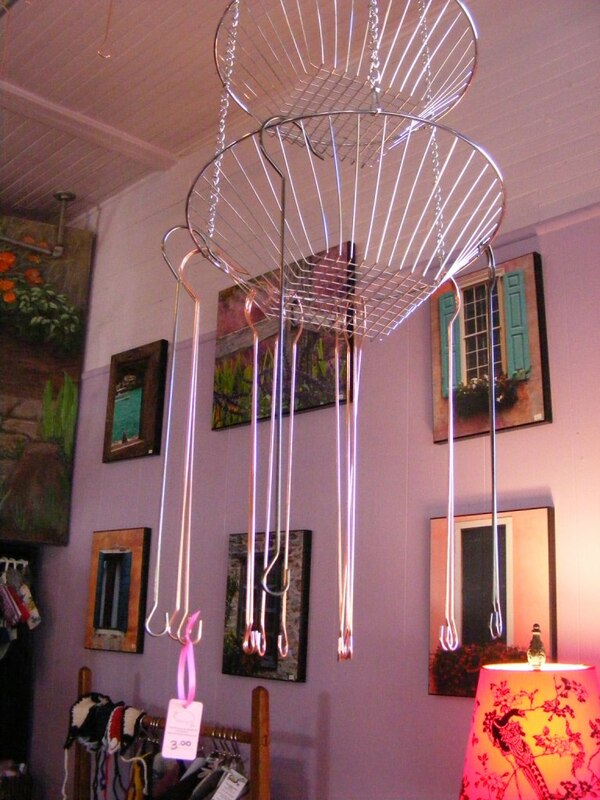 See these hooks hanging from a metal basket? I believe the tag says $3 each. You know when you see those beautiful handblown glass balls in stores and galleries, or some lovely thing that you know would be perfect in your home dangling in a window, casting off light, color and interesting shadows, but you have no idea how you’re going to hang it so you just pass on by? Wow, that was a long sentence. Well here’s the answer. I’m going to buy some of these to hang off the curtain rod in the living room in the big window. Then I’m going to hang vintage Christmas ornaments that I’ve had forever on the ends. I’ll do this after Thanksgiving. That’s my plan anyway. But I could think of 100 things to hang from these hooks that will look great, and not just for the holidays. I hope Diane has lots of these in stock. While you’re there, be sure to really look around and scoop up some of the other items in the store. They won’t be there if you think you can come back later. She has a great eye, lots of customers, lovely, unique items for sale AND she’s far from the mall, so you will totally enjoy your shopping experience. Really, this whole store was a find. Today I went to the Preview of Southern City Markets Antiques and Interiors Sale Event (quite a mouthful). They had advertised heavily in the design community; postcards, FaceBook alerts, emails, so I thought they deserved a visit because of all that effort! There’s an interesting mix of items from several local vendors. While I was there, I took a picture of the bench below because it illustrates how nicely a pretty cushion finishes off a bench and wasn’t I just showing you a bench last week in my Find of the Week post? Yes, I was! 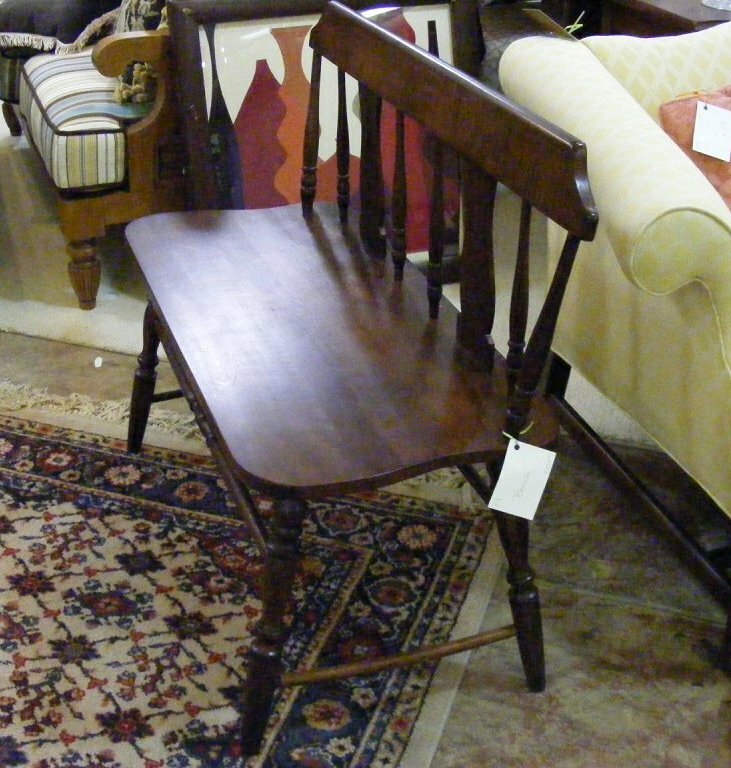 Here’s the bench (ok, more like a settee) from today’s sale. Very pretty. 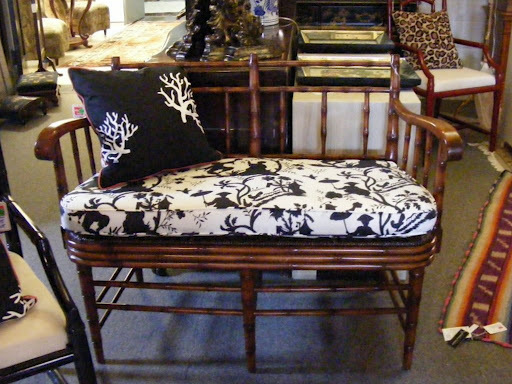 And here’s the bench from last week’s Find at Hunt and Gather. A cushion would polish it right up. Since there are no sides to this bench, I’d be sure to have little ties in the back to attach it safely. The Southern City Markets sale is being held from November 4-7, at 312 W. Johnson Street in Raleigh. Have fun!